There are many attractions in Camden Fort Meagher with exhibitions located in the area which accommodated military personnel over the centuries. One such exhibition is the First World War Memorial Room which tells the story of the eighteen Irish Regiments which existed over the centuries. The fort recognised that the story of the Irish during the war had been airbrushed from our history books in the Republic of Ireland, and felt that the fort was a perfect location to give the Irish Regiments a permanent home to tell their story. The memorial room covers the period from their inception over the centuries to the time of their disbandment or absorption into other regiments. While there are many historical centres in existence that tells the story of individual Irish Regiments, the memorial room located in Camden Fort Meagher is the only one on the Island of Ireland or Great Britain that records the history of all the Irish Regiments in one location. A very important aspect of the room is eighteen specially designed ‘Regimental Memorial Flags’ along with three others representing the Irish Divisions, are carried on parade for special ceremonies within the fort and available on request to any association which look to have them on their parade for ceremonies connected with the First World War. The assistance of the Royal British Legion was gratefully recieved for this aspect of the project and who kindly donated the funding to bring this aspect of the memorial room to fruition. Another very important aspect of the Memorial Room is the research facility that now exists there to allow people to come and have a relative’s story researched. In this case, it does not matter if they fought on land, at sea or in the air including the Mercantile Marine. This includes those who fought and lived through the war which is often forgotten, where all stories begin when they were born and continues until they died. In some cases, the research centre incorporates the assistance of a researcher based in England and where Richard Moles is of great assistance to both the centre and families to complete the story of a relative. The story is then written into the Book of Remembrance which is in the memorial room, and where the family receive a special Certificate of Remembrance along with a copy of their relative’s story. The last aspect of the memorial room and research centre is the ‘Garden of Remembrance’ located in the shadow of the ‘Crimea Tree’. 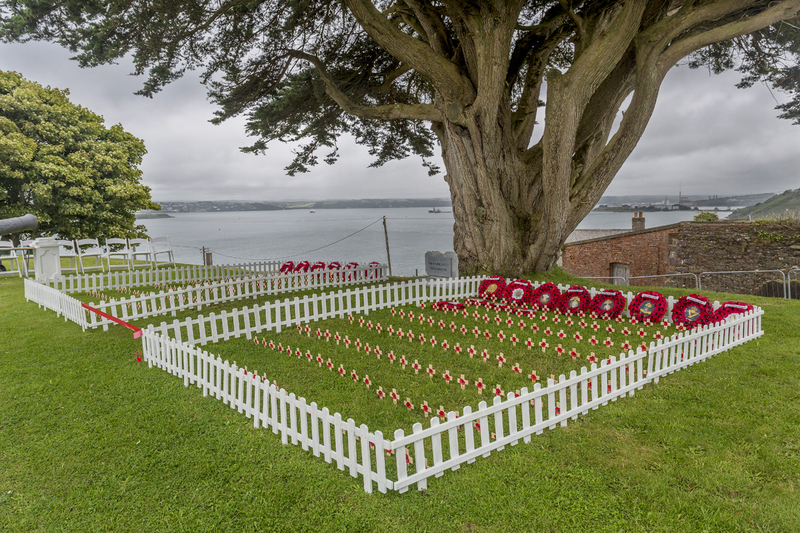 The garden consists of 400 miniature crosses of remembrance and where the relatives of those who have been researched are inducted at special ceremonies that take place in September each year. Also on display adjacent to the garden is the Book of Remembrance with the Certificate of Remembrance incorporated into it to allow the public to understand their stories and are encouraged to visit the memorial room to read their full story in the Book of Remembrance. Finally, if you have a story to tell or require special research to be undertaken then the process can begin by visiting the memorial room in Camden Fort Meagher. There, Jerry Conroy is the resident historical researcher and is in attendance during the period when the fort is open to the public from May through to mid-September. Alternatively, you can contact him by phone at 021-4341676 or 087-7782940 any time after six pm or email him at jerry.conroy@hotmail.com. A student of history, he has been researching the story of the Irish Regiments for fifteen years and also conducts Journeys of Remembrance to the battle fields of the First World War. This includes a special six-day visit to the Western Front in late June 2017 and can be contacts if you wish to travel.